In The Constitution of India: A Contextual Analysis, Arun K. Thiruvengadam provides a concise introduction to the Indian Constitution, with insights not only into its history but also the political and legal events that have contributed to its evolution. Sania Ismailee recommends this accessible and engaging book to anyone who is keen to understand the underpinnings of the constitutional system in India. The Constitution of India: A Contextual Analysis. Arun K. Thiruvengadam. Bloomsbury/Hart Publishing. 2017. 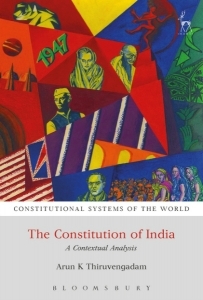 FPart of the ‘Constitutional Systems of the World’ series, Arun K. Thiruvengadam’s The Constitution of India provides a concise introduction to the Indian constitutional system, with insights not only into its history but also the political and legal events that have contributed to its evolution. The Indian Constitution’s role in sustaining one of the world’s largest democracies that inhabits pluralism and Thiruvengadam’s expertise in constitutionalism in South Asia make this book an interesting read. It notes the impact of political bargains and extra-legal developments in the Indian Constitution’s evolution instead of treating it as a standalone doctrine. By focusing on the overall socio-political context up until May 2017, the book departs from the dominant tendency in legal scholarship to restrict attention to individual cases. It also addresses the challenges posed to the constitutional order over its working span across nearly seven decades. The Constitution of India consists of seven chapters, an introduction and a conclusion. It traces the development of ideas and concepts in the making of the Constitution. At the beginning of each chapter, the author provides the pre-history, the colonial experience and the relevant constitutional provisions related to the main subject. This is followed by an exposition of the topic and the relevance of particular events in the Constitution’s development over the years. Throughout the book, Thiruvengadam attempts to ‘present the Indian Constitution as a site for continuing contestations’ (4) by highlighting the ‘living nature of the text’ (4). He views it with a critical eye and emphasises the ambiguities and gaps embedded in it. The author alludes to 1947 and 1991 – the latter marking the introduction of policies that led to key transformations in the Indian economy and polity – as two crucial historical moments rather than confining the scope of his analysis to nostalgia surrounding the year of India’s independence. Moreover, the author draws attention to certain portions of the text of the Constitution that are understudied – specifically, those that deal with the institutions of governance. Indeed, this is a unique contribution to the existing literature. Chapters Two, Three and Five are devoted to the executive and Parliament, federalism and local government, technocratic constitutional institutions like the Comptroller and Auditor General of India (CAG) and the Election Commission of India (EC), respectively. Thiruvengadam discusses the CAG and the EC as ‘unusual’ institutions because they have gained a reputation for ‘safeguarding constitutional and democratic values in contemporary India’ (137). His study reflects the dynamic nature of these institutions by evaluating the effects of successive tenures of government over them. Throughout these chapters, he tries to show how certain transformations can be brought about informally without altering the Constitution: for example, the prominence gained by decentralisation and local governments over the years. Thiruvengadam sheds light on the continuities between the colonial and the postcolonial state. He also identifies the motivating logic behind the foundational principles of the Constitution. The author pays close attention to the relationship between the three organs of the government – the legislature, the executive and the judiciary. Acknowledging the checks and balance of powers between the three organs, the emergence of the judiciary’s primacy in the last seven decades constitutes one of the major arguments in the book. Chapters Four and Six deal with this theme extensively. Chapter Four discusses fundamental rights (the basic civil liberties of the people), the directive principles of state policy and the role of the judiciary as a guardian of fundamental rights. The decision of the framers of the Constitution to distinguish between fundamental rights and the directive principles as two classes of rights on the basis of their justiciable nature is firstly explained. The uniqueness of the judiciary in sustaining constitutional democracy is brought forth clearly as compared to other countries in South Asia. Thiruvengadam’s analysis is novel because despite praising the judiciary, he reminds us that this role needs to be put in perspective given the backlog and pendency of cases and the slow process through which it works, which cripples its effective functioning. He argues that the constitutional scheme was one of the reasons for the backlog. While the framers had assigned strong powers to the judiciary, they made it subsidiary to Parliament and the executive. Thiruvengadam observes a reversal of this vision in post-independence India. This reversal has been so pronounced that the judiciary is ‘perceived by many political commentators as the most powerful political actor in the Indian constitutional landscape’ (119). For instance, a five-judge bench declared the National Judicial Appointments Commission Act 2014, which dealt with the appointments of judges, as unconstitutional because the act gave undue powers to the executive. Chapter Six, the longest in the book, elaborates upon the constitutional regulation of Indian citizens’ identities. The emphasis upon the judiciary’s role continues here from Chapters Three and Four. This chapter discusses five identities – religion, language, caste, class and gender. It does not cover the question of LGBTQ identities or other contested identities because it addresses only those that were a major source of conflict at the time of independence. The mechanism behind accommodating the principles of multiculturalism in a largely liberal framework is elaborated upon. One of the most contested issues discussed in this chapter is religious identity, including the reform of religious practices like the practice of personal laws (family laws based on religion). Thiruvengadam emphasises the primacy of the legislature’s role as a reformer of oppressive practices, justified by an appeal to religion, at the eve of independence. However, he observes the gradual shift towards the legislature taking a backseat and the judiciary assuming the reformer’s role due to the surrounding political conditions. For example, the Constitution-makers espoused the enactment of a Uniform Civil Code (UCC) as a uniform law to replace the gender discriminatory and religion-based personal laws. Over the years, the legislature’s failure to enact this led the Supreme Court (SC) to order the legislature and the executive to pass a UCC. Thiruvengadam analyses how the envisioned role for the executive and the legislature has not been realised to its full potential due to a variety of political reasons. For example, while the Indian National Congress government did not actively undertake reform of personal laws due to insecurities about reducing its vote bank, the Bharatiya Janata Party (BJP) government actively undertook reforms. To reform religions, which was met by vehement opposition from religious groups, the SC devised the ‘essential practices test’ and undertook interpretation of faiths. However, Thiruvengadam cautions against an uncritical celebration of the SC’s role. He points out that judges with majoritarian sympathies can pass judgements to favour fringe elements. For example, the 1996 judgement that ‘Hinduism is a way of life’ (1996) was appropriated by Hindu nationalists. One of the merits of the book’s structure is that at the end of each chapter, Thiruvengadam points towards ‘further readings’. Repeated references to a few books in these lists enable the reader to identify the most important scholarly – classical and contemporary – works on the legal system and the key institutions in the Indian context. Another strength of the book is its up-to-date analysis. It covers the major legal and political developments until May 2017. The concluding chapter provides a brief overview of Prime Minister Narendra Modi’s tenure, which began in 2014, through a constitutional lens. Thiruvengadam covers the tensions between the judiciary and the executive, concerns related to secularism as well as attacks on civil liberties, including issues relating to the curbing of media freedom. This book is a recommended read for academics of constitutional law, students, researchers and anyone who is keen to understand the underpinnings of the Indian constitutional system. It introduces the reader to the rollercoaster ride of India’s constitutional journey through darker times. Woven together in a narrative form and written in accessible prose, it keeps the reader engaged throughout. Sania Ismailee is a doctoral fellow in the Department of Humanities and Social Sciences at the Indian Institute of Technology Delhi. Her research interests include political philosophy, philosophy of law, Islamic law, moral philosophy, religion and feminist philosophy. Currently, she is working on secularism in India. Audit 2017: How democratic is the basic constitutional law of the UK? What does ‘Brexit means Brexit’ actually mean?